Some glass artists talk of the light; reflection and refraction. Others of space and volume and form, or the ambiguous nature of glass, solid or liquid. Corey Broman does not seem to be limited to any one characteristic visually. Glass Works, Broman’s current exhibit at the Sunderland Gallery, is another example of the technical prowess and sculptural depth of this Omaha glass artist. His newest work springs forth from the sounds of glass; from the kiln fires, the cracking and tinkling sounds of the ever expanding and contracting globs, to the cold-working into graceful totemic pieces. Most former shows have demonstrated Broman’s preference for working with color, and sculptural form, but his adept gymnastics with all types of glass continues. This outing brings a sampling of his next chapter, taking us into a world of crystalline clarity, while retaining his signature simplicity and sculptural insight. The newest works are a deft manipulation of shapes, textures, and carvings that create a refined symphony of intimate sculptures, but without color. Harmony, often described as the vertical dimension of music, probably best describes the quality of the individual works. Each has an intrinsic set of notes, that when played together, reaches heights that exceed the sum of the parts. Musical analogies in the visual arts are certainly not new, but the term describes best the aural essence of these sculptures on display at Sunderland. Broman’s confident hand is partially a result of his time at the highly-regarded glass studios at Hastings College, and of his devotion, evidenced by continually attending workshops to learn new processes. In only six years of public exhibitions, his colorfully handsome sculptures have become deservedly recognizable. No mystery then that he aspires to what used to be the pièce de résistance of glasswork, Venetian crystal. For centuries, glass making was severely limited in its refinements; always a scar or defect, like air bubbles and cracks due to inconsistent heating and cooling, specks of charcoal and ash, inherent coloring and fog due to mineral contaminants in the sands, or lack of control in the kilns. Pre-Renaissance Venetians were very advanced and produced some exquisite utilitarian and decorative work, and they developed some of the world’s highest quality glass. The holy grail however, crystal clear, smooth and strong glass free from all defects, puzzled all until around 1450, when a glassmaker named Angelo Barovier developed cristallo, or Venetian crystal, a totally defect free glass. 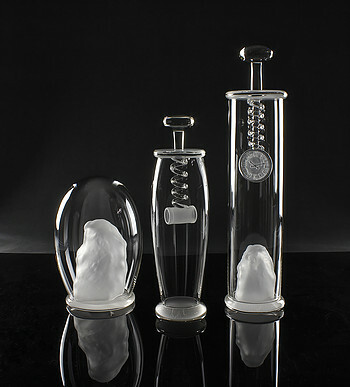 The most recent of Broman’s works, “Orthodox Volume 1 through 5”, are groupings of three Venetian crystal bell jars, each flaunting or protecting a “specimen”; save for “Orthodox Volume 5”, which has only two bell jars. This slight diversion from the triptych seemed a little odd, but the sculptural aesthetics of “5” are not weakened. All are botanical or at least biomorphic except for “Orthodox Volume 4”, the more enigmatic of the works. It has one jar protecting a sole rock, another an unidentified machine part, in the third, a clock with the rock form repeated; this possibly a reference to the famous bell jar/alarm clock experiment demonstrating the necessity of air in the transfer of sound. They are at first fragile bladders, ready to burst at the slightest suggestion of a differential in air pressure or clap of thunder. Then slowly, these elegant displays take on a refined, museum-basement quality, becoming organic relics, on their first public display in centuries. The specimens are real enough representations that they could be earthly, but maybe not. “Garden Imposter” is two hollow chunks of rock, etched with a diaphanous web of filament that seems to be the only thing preventing these from shattering if you look too hard at them. They are obviously hollow, and surely placing an ear to these would reveal hum or hiss of ocean-like music. “20/20 Vision”—sharpened is one of the least organic of the colorless works, looking a little like James Dyson might have had a hand in its final design. A bold, etched hoop stands on a simple post (think rods) like a magic lens, daring that you look through, suggesting anything located inside the hoop, or sound waves passing through, will be sharpend. It is accompanied by a much smaller cylinder on a cone shaped pedestal (cones), carved as if it were meant to be a specialty lens or instrument, with one specific, but elusive, use. The Sunderland Gallery is an attractive venue for Broman’s attention to detail and the enjoy the various reflective qualities found in some of the glass. A bank of windows provides minimal but necessary reflections. Clear glass is invisible without them. (How many have walked into a clear glass sliding door before?) Much of the work is displayed on light tables, which illuminates without adding reflections, and brings out the fine details of his modeling and extensive cold-working. This enhances both the new crystal works and the less recent color works. 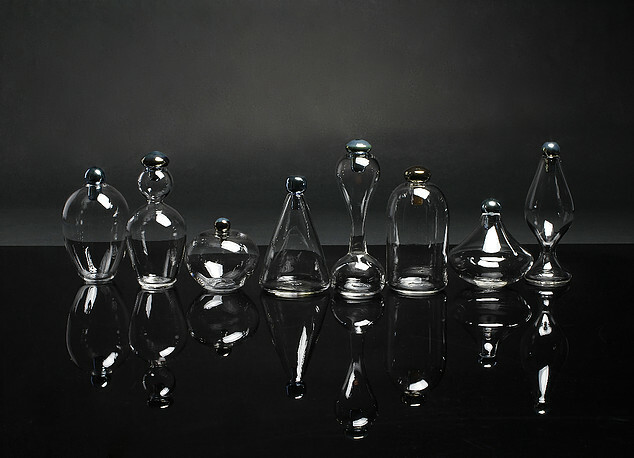 “Eight Tiny Bottles” is another piece that benefits greatly from the light table display. This is a group of unassuming, delicate containers, mated by association, as if removing just one would destroy the whole work. Disappointing, however, is the necessity of leaving masking tape on the lids, obscuring the impact of the metallic patina. Broman tends to work in a very unorthodox manner, at least compared to other glass artists. Most work with assistants, he prefers to work alone. He works smaller in the kiln, and then through various joinery and cold-working, assembles the final piece. 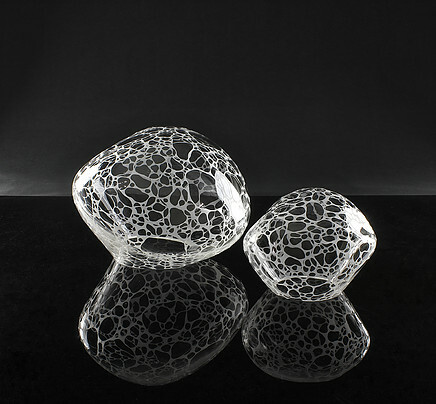 He is mostly known for his use of black and highly colored glass in his sculpture, many of which carry a taste of East Asian design, and modern simplicity. 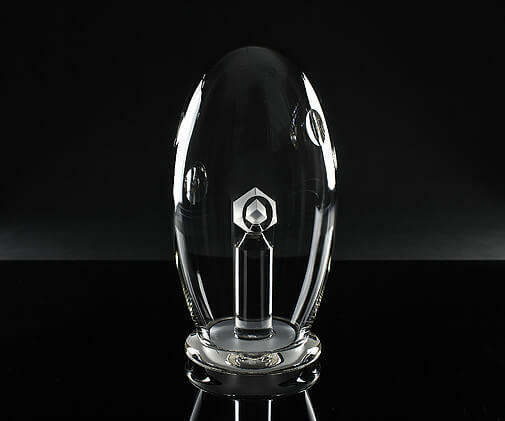 Another significant piece in the bell jar category, is “Judge,” a transparent egg housing a simple etched cube. Depending on the angle of view, the cube can be “captured” in fine reducing lenses cut ever so cleanly into the enclosure. This work is suggesting discrimination, seemingly asking an opinion, while offering several. Art glass at one time was confined to the commercial foundry and manned by several artisans all working together; the ovens and temperatures and amounts of molten glass were unfeasible for the home or small studio or a single person. In 1957, a ceramicist named Harvey Littleton changed all that. With the help of others in the fields of ceramics and chemistry, he developed a smaller kiln and more suitable glass formulas so that the smaller studio was now feasible. One common process made possible by the smaller furnaces and more user-friendly glass, is the process of fusing glass inside the kiln, creating a simple mass or flat tile. Broman’s “Rorsach Series”, a group of six wall-hung arrangements of clear glass tiles fused with metal foil to create an encased graphic, alien hieroglyphics displayed for your attempt at translation. Failing that, don’t despair. An appreciation of Broman’s artistry in Glass Works is all the takeaway one needs.